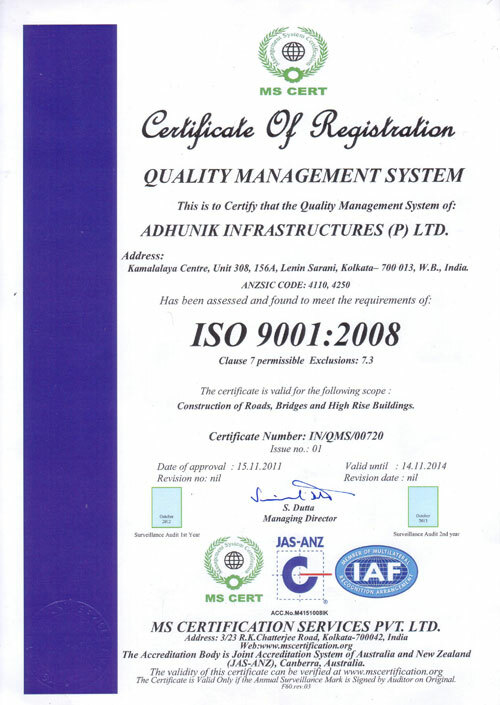 Adhunik Infrastructures (P) Ltd is ISO 9001:2008 accredited and is regularly audited to ensure compliance with our adopted quality management systems. We are committed to meet and exceed the expectations of Quality, Cost, Delivery and Response Time from our customers. In order to assure the quality standards in its works, a complete Quality Assurance Plan is implemented in all the projects executed by the company. Quality check points are installed at every level to ensure the best product and service is delivered to our customers adhering to the set specifications, contractual, regulatory and statutory requirements. Our staff is trained in different aspects of QA throughout all systems and processes employed by the company. Field & Laboratory tests are carried out with all high tech testing equipments as per specifications requirements for the Quality Control Assurance. The Company strives to consistently deliver enhanced value to customers, through continual improvement of products, services and systems by way of innovative assimilation of new technologies and development of human resources.